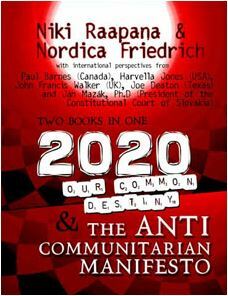 Niki Raapana is an independent researcher, co-founder of the Anti Communitarian League (ACL) with Nordica Friedrich, co- author of2020: Our Common Destiny and co-author of the Anti Communitarian Manifesto. 2020: Our Common Destiny & The Anti Communitarian Manifesto (ISBN-13: 978-0-9814519-2-3) explores the history, philosophy, and modern-day implementation of Sustainable Development, Communitarian Law, and Community Policing. Part-autobiography, part-thesis, and part-guidebook to International Law, this 327-page book introduces Community Law with a mix of personal experiences, field research, and direct quotes from American presidents and international heads of state, domestic and foreign courts, officials, ecclesiastics, gurus, agencies, think tanks, universities and law schools, foundations, conferences, scientific reports, newspapers, and academic journals. The Roosevelt Neighborhood Plan (Washington) and The Anchorage 2020/Anchorage Bowl Comprehensive Plan (Alaska) are highlighted to show how Local Agenda 21 plans balance individuals, laws, and economic growth. Readers are challenged to consider some of the little-known aspects of Community Economic Development, like mapping and mobilizing human assets, data-mining, innovative militarized policing, mandates for service, global citizenship, the Hegelian Dialectic, and the ancient spiritual foundation for a worldwide, corporate, quasi-religious legal framework. Niki Raapana and Nordica Friedrich began publishing in 2000, after they were used as uninformed Human Subjects Research in Seattle, Washington. Their original analysis of Communitarianism reaches an international audience; their work has been referenced and reproduced in books, websites, articles, curriculums and academic papers, including the National Association of Scholars Bibliography of the Communitarian Residence Life Movement.